The Oriental Republic of Uruguay is located in the southeastern part of South America. The country's total area is 176,215 km2 (68,037 square miles). In 2009 it was home to an estimated 3,494,382 people. Most Uruguayans are the descendants of European colonial settlers (88%), while 8% are mestizo, a mix of European and Amerindian ancestry, 4% are black, and a small number are Amerindian. In 2006, Uruguayans belonged to the following religious groups: Roman Catholic (47.1%), non-Catholic Christians (11.1%), nondenominational (23.2%), Jewish (0.9%), atheist or agnostic (17.2%), and other (1.1%). Uruguay is the smallest independent country in South America. Its 72,000 square miles, extending about 350 miles both east to west and north to south, is wedged between the two giants of Latin America, Brazil to the north and Argentina to the west and south. Culturally Uruguay is the most progressive of all South American countries. Its two and one-third million people are mostly of early Spanish and Italian descent, although there are people of German and French immigrant extraction. Montevideo (pop. 700,000 in 1959), the capital city, is one of the cultural centers of South America. The country's educational program is one of the most progressive and democratic in the world. Attendance is compulsory at its 1500 free public schools. All citizens 18 years old and over are compelled to vote. Although most Uruguayans are Roman Catholic, there is complete religious freedom for all. The settlement of Mennonites in Uruguay began in 1948 after the Mennonites from West Prussia had been displaced during the gigantic population upheaval there during and following World War II. Most of these Mennonites, who were temporarily stationed in displaced persons camps in Denmark, were unable to enter Canada and the United States because of their German citizenship. Settlement possibilities in such countries as Brazil, Argentina, and Mexico did not seem favorable, and most of the Danzig Mennonites were opposed to settling in Paraguay. As a last resort they agreed to settle in Eastern Paraguay, in case no other possibilities were open to them. The Mennonite Central Committee (MCC), in close touch with these refugees, explored possibilities in Uruguay. Rather unexpectedly opportunity presented itself for entrance and permanent settlement in this country, and on 27 October 1948, the first contingent of 690 Mennonites from Danzig and 60 from Poland arrived in Uruguay. These 20th-century pilgrims had the unusual experience of embarking from Europe for South America without knowing whether they were headed for Paraguay or Uruguay since they had not received official government permission from Uruguay when the ship left Europe. The official assurance was then wired to them on board ship. With help from the Uruguayan Institute of Colonization and the MCC they were settled in Uruguay. The first contingent was temporarily quartered near the city of Paysandu along the Argentinian border, 250 of them in old army barracks and a vacant warehouse at Colonia, and the remaining 500 in old army barracks at Arapey. Being eager to work, individuals and small groups immediately took whatever jobs they could find—as skilled laborers and factory and farm hands, while others rented small acreages. Many widows and girls found employment as domestics in the cities, especially in Montevideo. The first permanent settlement was made in April 1950 on a 2,900-acre ranch known locally as El Ombu, located about 180 miles northwest of Montevideo near the town of Young. This tract was large enough for only about half the total group. The rest continued to find work over widely scattered areas. Some of these were not able to get on land of their own until after the second large land purchase in 1951. The El Ombu ranch was divided into 75 homesteads of varying sizes. The farmers organized an agricultural co-operative in September 1950. The land is owned by the co-operative and cannot be sold without colony permission. The major portion of the credit for the corporate purchase of the land was advanced by the Uruguayan Institute of Colonization. Repayment is arranged over a 30-year period at 5½ per cent interest. Chief crops produced are wheat, peanuts, sunflowers, corn, kaffir, oats, and Sudan grass. Cream and butter also yield substantial cash income. In October 1951 a second contingent of 431 Danzig refugees landed at Montevideo to boost the total Mennonite population in Uruguay to almost 1,200. Under the leadership of the MCC a subsidiary nonprofit corporation known as Uruguay Land Associates was organized by a group of Mennonites, mostly in Kansas and Nebraska, and a sum of $65,000 was raised as a loan to help the new arrivals settle on land. Again with the help of the Uruguayan Institute of Colonization a tract of land was purchased. It was a 4,500-acre ranch known as Brabancia and located near Tres Bocas and now known as the Gartental settlement. The land was divided into 139 homesteads of varying size, of which 100 were assigned to the newly arrived settlers, and the rest to the Mennonite settlers of 1948 who, because of lack of land, had not been able to settle at El Ombu. The third colony in Uruguay, named Delta after the Vistula Delta homeland, was established in 1955 on a tract of ca. 3,600 acres in the San José Department about 60 miles northwest of Montevideo, some 150 miles southwest of El Ombu and Gartental. Part of the funds for the land purchased were again furnished by North American Mennonites. The tract was divided into farms of 75 acres, and occupied initially by 40 families, all part of the previously immigrated groups. Culturally in some respects the Uruguay Mennonites hold more liberal views than other South American Mennonites, especially than those in Paraguay. The main body has organized itself in the Konferenz der Mennonitengemeinden in Uruguay (Conference of Mennonite Churches in Uruguay), and is affiliated with the General Conference Mennonite Church (GCM) in North America and the Vereinigung der deutschen Mennoniten-Gemeinden (Union of German Mennonite Congregations) in Germany. It had four congregations in 1957: El Ombu 255, Gartental 249, Montevideo 200, and Colonia Delta 120, a total of 809 baptized members. A group of 38 organized a Mennonite Brethren (MB, now the Consejo de las Congregaciónes de los Hermanos Menonitas, Uruguay) congregation on board ship en route to Uruguay in 1948. All of these came from the Wymysle area in Central Poland. Its total membership in 1957 was 91. The colonies have established their own elementary schools, but teach the nationally approved curriculum. Because of the generally favorable economic, social, and cultural conditions in Uruguay the Mennonites are rapidly becoming established. It is likely that those who immigrated there will remain permanently, and it is entirely possible that Mennonites from other South American countries may in small groups migrate there too. Generally the colonists are well satisfied with their new home. By comparison with their coreligionists in Brazil and Paraguay their early years have been considerably less difficult. The MCC has since 1948 maintained a center in Montevideo as a co-ordinating and contact agency with North America, now at Vilardebo 964. In 1956, at the same address, the Mennonite Biblical Seminary was established as a bilingual training school operated by a board composed of representatives of all the groups in South America desiring to co-operate (all do except the MB), supported by the GCM and Mennonite Church (MC) mission boards of North America. The attendance in 1957 was about 36 students. According to the 1986 census, almost half of the less than 3 million inhabitants of Uruguay lived in the capital city of Montevideo. Only 4 percent claimed active membership in any religious community, including the Roman Catholic Church, the largest denomination. According to 2005 figures, there were approximately 3,415,000 people in Uruguay, with 1.8 million, nearly 53 percent of the population living in or around Montevideo. While 66% considered themselves to be Roman Catholic, approximately only one-third of that number actually attended church regularly. During the first half of the 20th century Uruguay experienced a period of extraordinary economic, civic, social, and cultural growth. Signs of deterioration began to show thereafter and the country gradually ceased to be known as "the Switzerland of America." In 1973 the country came under the control of a military junta in response to a subversive guerrilla movement which had arisen to protest corrupt administrative practices. The years which followed saw a people long-accustomed to political liberty subjected to suffering, oppression and self-repression. Individual liberties were suspended and human rights violated. By 1980 a major movement of civic opposition developed which led eventually to democratic elections in 1984 and a constitutionally elected president in 1985. Social and economic conditions reflected the turmoil of the recent years: in Montevideo, 40 percent of the families lived below the poverty level with incomes that were less than twice the cost of food; 13 percent were indigent; 25 percent of the children admitted to hospitals were found to be suffering from malnutrition. The quality and reach of education dropped. In 1986 the total baptized Mennonite membership was 1,000 (1,220 in 2003). Of these, 525 belonged to the four congregations of the Konferenz der Mennonitengemeinden, 295 belonged to the seven congregations affiliated with the Convención de las Iglesias Menonitas, and 180 belonged to the seven congregations organized under the Consejo de las Congregaciones de los Hermanos Menonitas (MB). In 1960, the Evangelization Board of the Mennonite Churches of Uruguay was organized to take care of local needs. These included the Seminario Evangélico Menonita de Teologia (1956-1973), which was replaced by Centro de estudios y retiros (Study and Retreat Center) of the Mennonite Churches in Uruguay in 1974. In 1986 it offered a three-year certificate program and regular schedule of weekend fellowship and study retreats. The Consejo also operated a training center in Montevideo. The two institutions carried on some parts of their programs cooperatively. The cooperative practices of the German-speaking Mennonite colonies (Konferenz der Mennonitengemeinden) were a modern adaptation of Christian brotherhood economic principles (mutual aid). These practices made it possible for the colonies to survive economically, whereas many individuals would not have been able to do so. In 1984 the Inter-Mennonite Council for Social Services was formed with representatives from the Convención, the Konferenz and the Consejo. It provided a channel through which congregations could share with brothers and sisters in need, as well as in the wider community. A similar concern led the Convención and the Konferenz to operate Hogar Siquem, a home for children and adolescents. The Mennonite Central Committee participated in both of these programs. Andres, H. J. "Colonia Menonite in Uruguay." Mennonite Life IV (July 1949): 15. Dück, W. "Neue Heimat in Uruguay." Mennonitischer Gemeinde-Kalender (1952): 56-65. Fretz, J. W. Pilgrims in Paraguay. Scottdale, 1953. Kraybill, Paul N., ed. Mennonite World Handbook. Lombard, IL: Mennonite World Conference, 1978: 264-271. Mennonite World Conference. "MWC - 2003 Caribbean, Central & South America Mennonite & Brethren in Christ Churches." Web. 30 June 2006. http://www.mwc-cmm.org/Directory/carcsam.html. Mennonite World Handbook Supplement. Strasbourg, France, and Lombard, IL: Mennonite World Conference, 1984. Mennonitischer Gemeinde-Kalender (1953): 63-66; (1955): 73-78; (1957): 30-35. Reimer, Gustav E. "Die Mennoniten in Uruguay." Mennonitische Geschichtsblätter Jg. 11, n.F. 6 (1954): 55-60. Reimer, Gustav E. "Von Danzig nach Uruguay." Mennonite Life IV (July 1949): 12-14. Wall, H. "Drei Jahre in Uruguay." Mennonitische Geschichtsblätter IX (1952): 18-26. Wikipedia. "Demographics of Uruguay." Web. 10 November 2010. http://en.wikipedia.org/wiki/Demographics_of_Uruguay. Wikipedia. "Uruguay." Web. 10 November 2010. http://en.wikipedia.org/wiki/Uruguay. Fretz, J. Winfield and Milka Rindzinski. "Uruguay." Global Anabaptist Mennonite Encyclopedia Online. May 2013. Web. 24 Apr 2019. http://gameo.org/index.php?title=Uruguay&oldid=132793. Fretz, J. Winfield and Milka Rindzinski. (May 2013). Uruguay. Global Anabaptist Mennonite Encyclopedia Online. 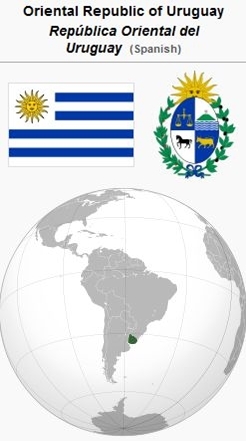 Retrieved 24 April 2019, from http://gameo.org/index.php?title=Uruguay&oldid=132793. Adapted by permission of Herald Press, Harrisonburg, Virginia, from Mennonite Encyclopedia, Vol. 4, pp. 790-791; vol. 5, pp. 907-908. All rights reserved. This page was last modified on 25 November 2015, at 17:32.